“Do you want a make up artist for your portrait session?” When I used to ask a potential client this question, women would answer “No, thanks. I can do my own.” Men would give a look that said having make up applied was an idea from a far distant planet. Those who chose to have make up and hair done were much happier with the results than those who opted out. That was then. Now it’s not an option. When I get a commission to make an executive portrait, the hair and makeup artist is part of the session. Period. In September, 1994, Photoshop version 3 debuted layers. 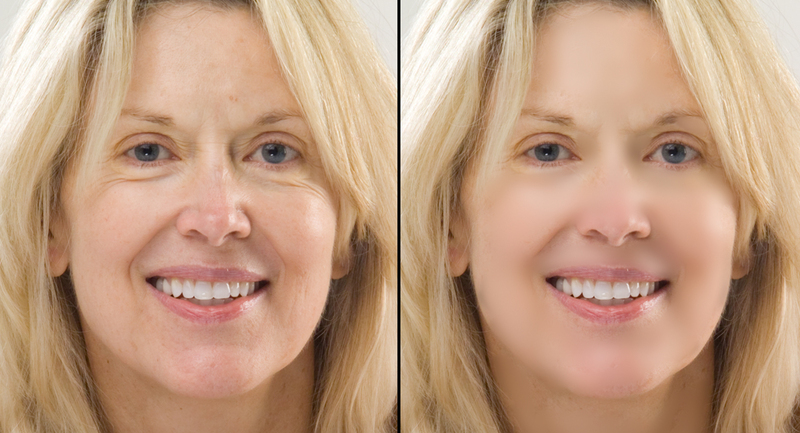 Photographers discovered Gaussian Blur for smoothing skin on a layer then masking the original, sharp eyes, eyebrows, lips, ears and hair. I heard more than one of them say “I don’t use make up artists. I use Photoshop instead.” Take a look at this photo of my friend Cheryl without makeup. Her natural no-makeup face is on the left. The version on the right has her skin blurred. This effect is so smooth her face seems to be made of plastic “Barbie doll” skin. One of the objections clients offer is that hair and makeup are too expensive. Not really. To stay in business a photographer has to paid for every aspect of their work. This includes retouching. An hour spent retouching a photo that isn’t charged on the client’s invoice is an income opportunity lost forever. Multiply that loss by six or seven photos from a session and the loss becomes staggering. Imagine giving away almost a full day’s income! Photographers can’t shoot for free. We can’t retouch for free either. Hair and make up save the photographer time in the retouching chair. Reflect the retouching charges in the services price list and all of a sudden a client can see the savings by having professional makeup and hair on site. Makeup for photography is different than everyday makeup women (and don’t be surprised) some men wear. It’s designed to stand out with the lighting the photographer uses. There are some hidden benefits too. The time a client spends in make up becomes a transition between the hectic busy-ness of their day and the photo shoot. This time is calming. For women it’s a time to be pampered. They know they will look great. This builds confidence. That confidence translates into a better result for the camera. Another bonus is the great hair and make up tips and product suggestions they’ve gotten from the artist. These photos of Cheryl were made under exactly the same lighting. The first is the no makeup or hair styling. The next one is with hair and makeup and the third adds about ten minutes of retouching in Photoshop. Look closely. There is very little difference between the photograph of Cheryl with hair and makeup and the retouched version. Makeup for photography is very different from makeup at the department store’s cosmetics counter. I’ve had clients say “I’ll have my makeup done at Macy’s.” This just doesn’t work. Practically every time I’ve made a portrait of a person wearing department store makeup, they’ve hated it. I finally came to the conclusion that it’s not professional to accept a client who won’t pay for a makeup artist. Here in Atlanta, makeup artists bring amazing talent for hairstyling to the shoot as well. 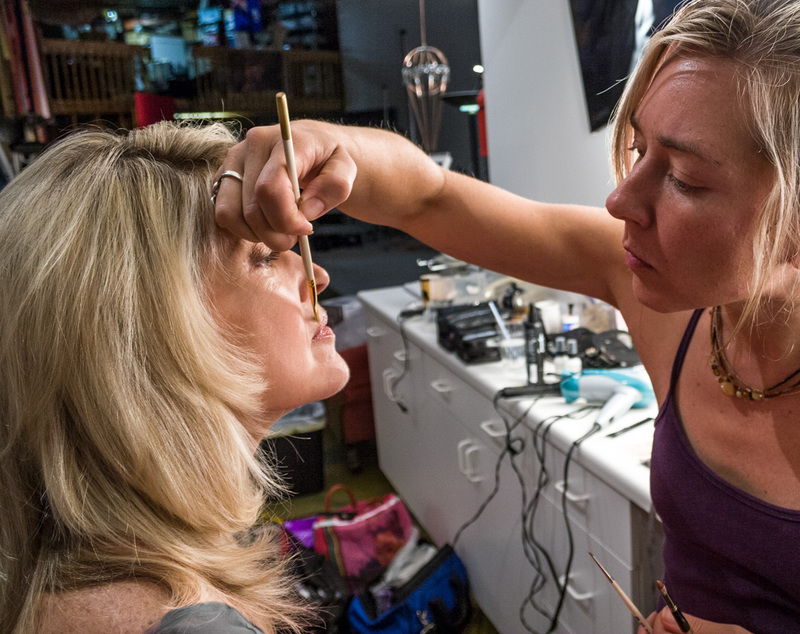 Below, hair and makeup artist, Amy George finishes up a beauty portrait of advertising model Amy Patterson. Here’s the result of the two Amy’s expertise behind and in front of my camera. Nice!